Ok, this is a stupid simple "trick" to quickly enhance your viewport speed. 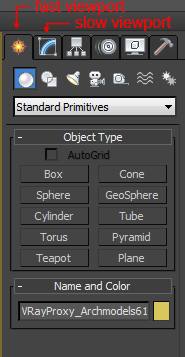 If you have a scene with a ton of stuff in it and are trying to just quickly move objects around, if you're selecting an object and waiting for a second before you can move it around, chances are you might have the modify tab selected. If you switch to the create tab, I can guarantee you your viewport will be more responsive. Thanks a lot for this simple trick - This will save me so much time!